In the annals of presidential elections, the hotly contested 1876 race between Rutherford B. Hayes and Samuel J. Tilden was in many ways as remarkable in its time as Bush versus Gore was in ours. Chief Justice William Rehnquist offers readers a colorful and peerlessly researched chronicle of the post—Civil War years, when the presidency of Ulysses S. Grant was marked by misjudgment and scandal, and Hayes, Republican governor of Ohio, vied with Tilden, a wealthy Democratic lawyer and successful corruption buster, to succeed Grant as America’s chief executive. The upshot was a very close popular vote (in favor of Tilden) that an irremediably deadlocked Congress was unable to resolve. In the pitched battle that ensued along party lines, the ultimate decision of who would be President rested with a commission that included five Supreme Court justices, as well as five congressional members from each party. 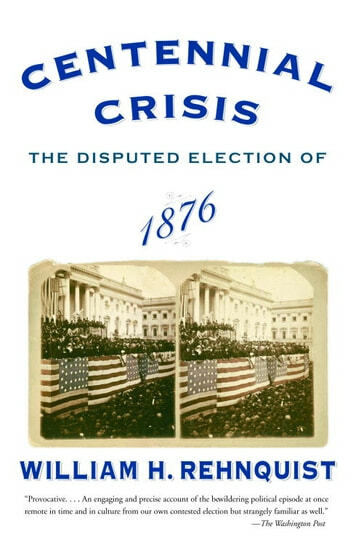 With a firm understanding of the energies that motivated the era’s movers and shakers, and no shortage of insight into the processes by which epochal decisions are made, Chief Justice Rehnquist draws the reader intimately into a nineteenth-century event that offers valuable history lessons for us in the twenty-first.